GuitarControl.com released a new video guitar lesson from GuitarControl.com instructor and creator Claude Johnson. In this guitar lesson, now available on YouTube.com, Claude Johnson teaches part 5 of a lesson on chromatic licks. “Hey! I got another chromatic lick for you”, says Johnson, “chromatic just means just one note at a time”. 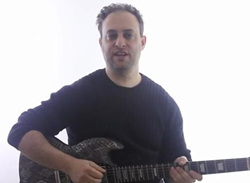 Claude demonstrates this easy lead guitar lick in the key of A pentatonic as follows. 9th fret of the 3rd string with first finger to the 10th fret with 2nd finger to the 11th fret with 3rd finger and to the 12th fret with 4th finger and then repeat this sequence on the 2nd string and then finally ending on the 10th fret of the 2nd string with 2nd finger. “If you really want to get into these chromatic patterns this is a good place to start”, says Johnson. Guitar TAB’s are available for this easy beginner lead guitar lesson at GuitarControl.com. The Chromatic Scale is a scale that uses 12 pitches each of which are one semitone above or below one another. Each semitone is the same size, 100 cents, and is equally spaced from one another.